Give Thanks and Come to Wood Badge! Wood Badge is an exciting, action-packed program designed to provide all adult members of the Boy Scouts of American with leadership skills and experience they can use in their home units, districts, or councils and in other situations demanding leadership of self and others. Wood Badge training was begun by Baden Powell in 1919 as a way to ensure that the leaders of Scout troops were properly trained. Since then Wood Badge has been held worldwide, providing advanced leadership training to thousands of Scout leaders. Reflecting the best of nearly a century of Scouting experience, Wood Badge draws upon the most current leadership models used by corporate America, academic circles and successful organizations throughout the country. By taking Wood Badge, Scouters will acquire valuable tools such as listening, communicating, conflict management, project planning and leading change. Participants will better learn to understand and appreciate diversity and differences in our society. They will learn skills that will make them a better Scout leader. Units with trained leaders are able to deliver an improved program and a more meaningful experience for the youth Scouting serves. 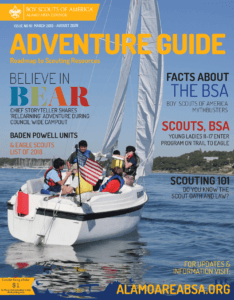 This electrifying and unforgettable training course takes place at BEAR CREEK SCOUT RESERVATION over two weekends (Mar. 22-24, 2019 and Apr. 12-14, 2019). Participants must 1) be registered members of the BSA age 18 or older; 2) have completed the basic training courses for their Scouting position; 3) be capable of functioning safely in an outdoor environment; 4) complete the Annual Health and Medical Record form, Parts A, B, and C; and 5) attend both weekends! We all have a lot to be thankful for – so come to Wood Badge and give yourself and your unit one more thing to be thankful for! REGISTER today by clicking on the Orange button to the right of this screen!